CPB asserts Trade Union Congress (TUC) recent resolutions contravene anti-worker rules of EU albeit failing to recognize benefits of leaving the EU. According a statement issued on the Communist Party of Britain (CPB) website on September 20, the Trade Union Congress (TUC) conference in Manchester marked ‘a small but significant shift to the left’. This was quoted by CPB trade union organiser Andy Bain to the Party's Political Committee. Resolutions of TUC such as those on privatisation, precarious and low-paid work, a 'New Deal' for workers, public sector pay, social security, national education service, sexual harassment and fracking were welcomed by the CPB statement. However, ‘TUC policies such as those to renationalise the railways, regulate public services contracts and fully protect all workers against super-exploitation contravened European Union rules and directives’ warned trade organizer Brain. Brain said, 'The TUC composite resolution rightly seeks to protect jobs and workers' rights in the Brexit process, but fails to recognise any of the potential benefits from leaving the EU and its anti-worker, anti-trade union court rulings.' 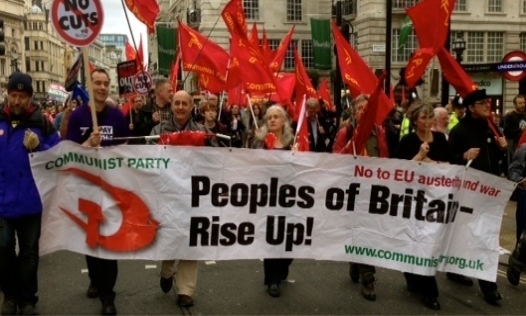 The CPB Political Committee condemned the spin put on the TUC decision to 'leave on the table the question of a second EU referendum’, which was subsequently misrepresented as positive, ‘unqualified TUC support for the business-funded, pro-EU People's Vote campaign’. The CP of Britain urged mass support for the People's Assembly demonstration at the Tory Party conference (Birmingham, September 29), the trade union 'Day of Action' against precarious work (October 4) and the TUC national demonstration against racism (London, October 20).